Check these out. Anybody here familiar with this company? 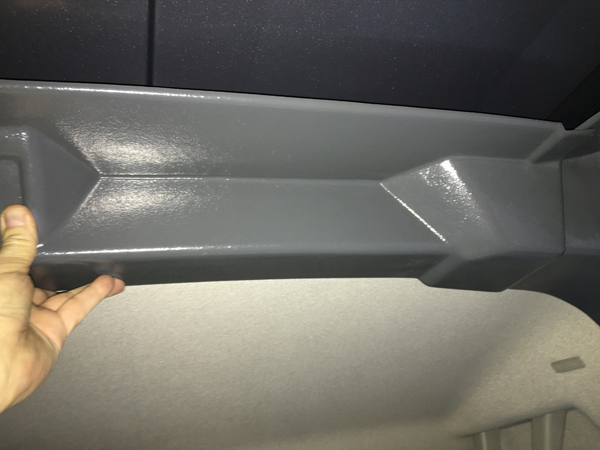 I did find one user on the Promaster forum that was happy with the product. I like the looks of those liners....too bad I have a low roof. I would be happy if I just had plastic trim for around my windows! 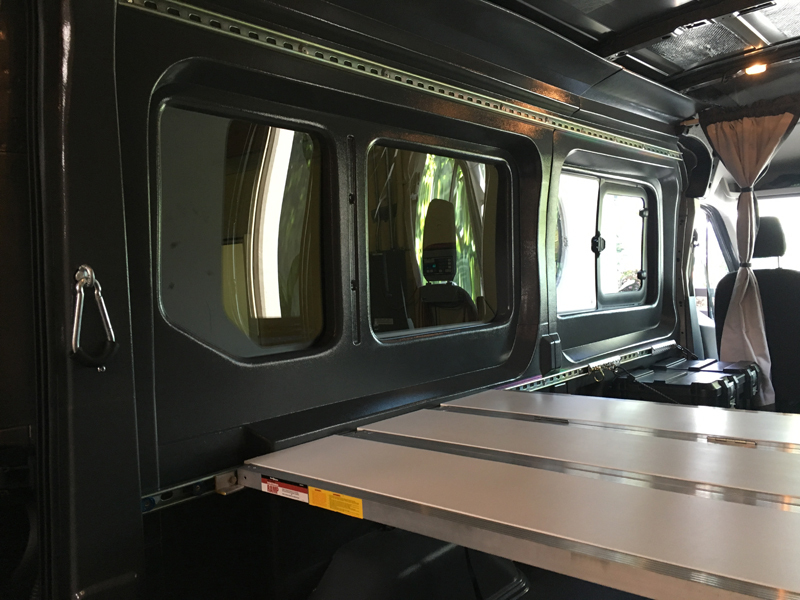 2016 T250 148" low roof with 40/60 side doors. Privacy windows all around, and lots of options. Will build a "stealthy" Touring/Camper. I feel more like I do now than I did a while ago. I went ahead and ordered the Bodyguard liner for my T250. I'll write up a thorough post on the install after I get done, but it will take a while so I'll just put a few photos here so people have some idea what they are like. This is just trial fitting the pieces. Everything seems to fit pretty well, although I will have to do some modification for my particular needs. Knot Yett, airmengarrettm and 4570 like this. How much was it? How do you like the Quigley? They first quoted about $1700 US plus freight for the grey color, and $2020 + freight for white, which seems to be lower than the MSRP shown on the invoice. The windowless version I think is a couple hundred bucks less. I asked for and received a discount, and the freight was a pretty reasonable $360 (from New Brunswick, Canada to N. California). The Quigley conversion is great. I haven't been using it in 4wd yet except for initial testing, but other than a taller ride height and slightly reduced fuel mileage from what others here report it is inconspicuous, having no ill effect on handling or stability that I can determine. Last edited by audiopyle; 01-22-2016 at 10:41:AM. Well I have been pecking away at the Transit. With business always taking priority it has been pretty slow progress, but I am gradually making some headway with my plan. This is going to be a multi-use vehicle seeing a lot of cargo hauling duty but set up to quickly convert for short term vacation getaways. I plan to eventually have a simple modular kitchen cabinet, enclosed chem toilet and some storage bins to keep things organized while travelling. I decided to install a couple of courses of low profile gold galvanized unistrut per side to secure things to. For what I am doing I feel it is more practical than the gorgeous conversions that I see framed in using 80/20 extrusions. 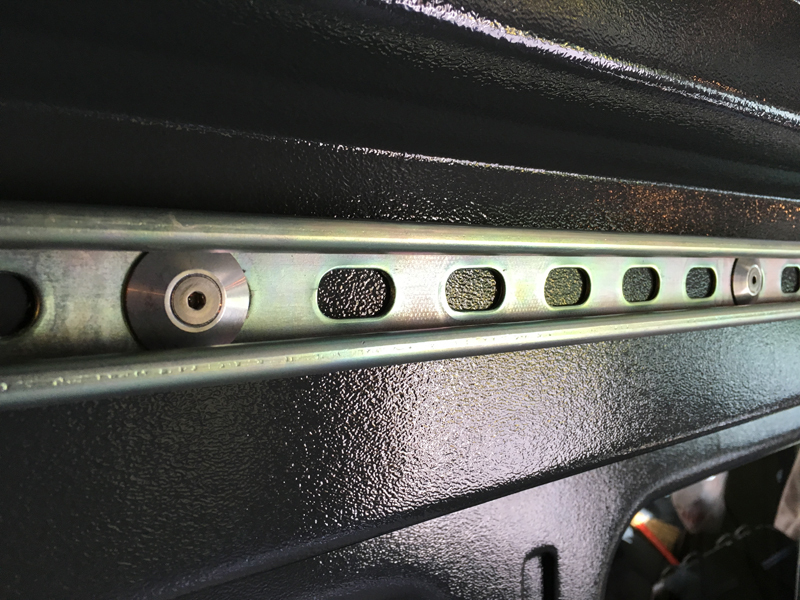 The strut is quite easy to secure to the walls due to the many slotted mounting holes and practically anything can be attached to it with a little ingenuity. I found a brand of L-track that clamps nicely to the strut making it easy to place standard track rings wherever I want them for retention. Doing things my way has required some mods to the Bodyguard liner kit I bought, and that is still a work in progress. I decided though to install everything that I have completed so far to make a short trip this week and see if I discover any quirks that need fixing. So here are a few photos of my interior design. This is the bare left wall prepped with threaded inserts and washers to back up the unistrut. 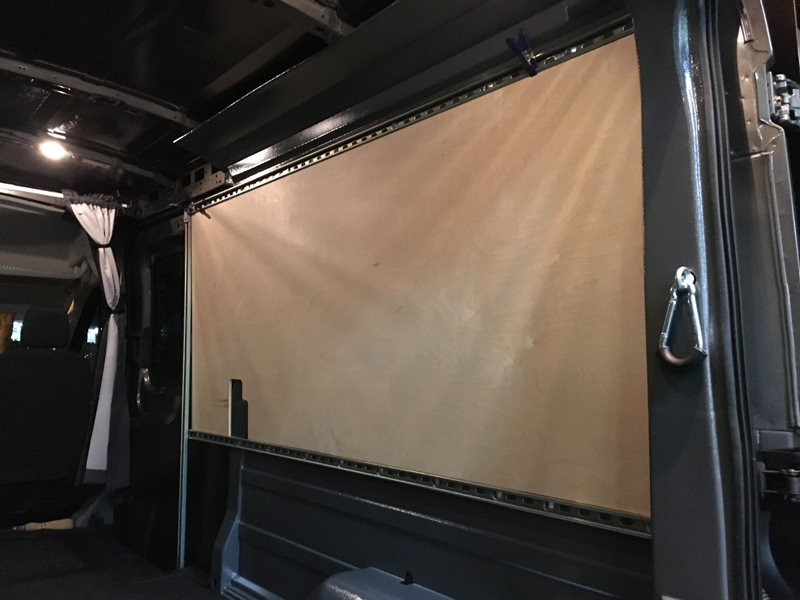 When I haul cargo I will have plywood installed over the windows. I plan to have a bulkhead or loadbars where the vertical strut is placed in the doorway to keep the cargo from shifting forward. 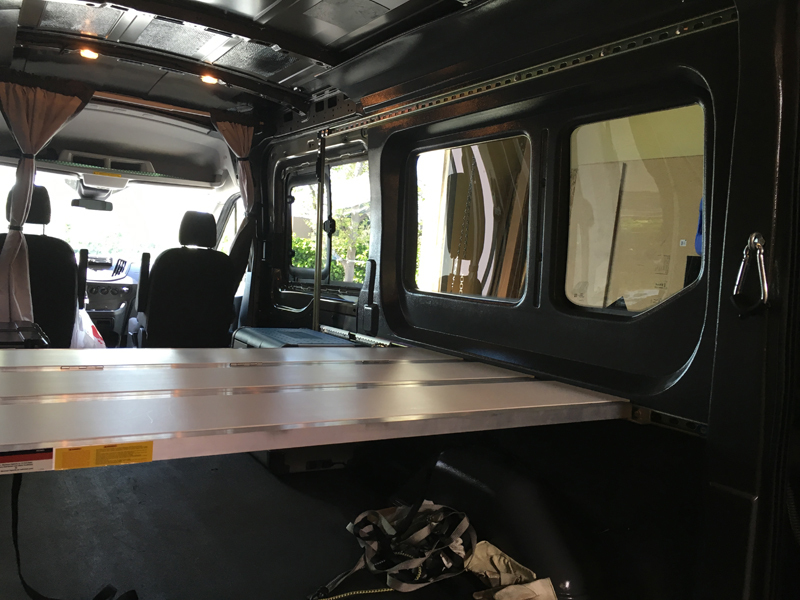 Here is my cross-bed platform, built from the Harbor Freight trifold ramp as other forum members have done. The white panels are 1/4" foamed PVC from Tap Plastic. It is resting on 1/4" thick 1 1/2" aluminum angle that is bolted to the unistrut. You can also see my new Dometic fridge / freezer. Left side of the platform. There are a couple of pieces of L-track bolted to the strut up front. Closeup of the unistrut mounting. The tapered Keyser aluminum washers are from Summit Racing online. I have a good local source for stainless steel bolts so that is what I'm using throughout. vnehess, Budsky, Haulin' Gas Adventures and 1 others like this. Thank you for posting! How is the platform rigidity with the unistrut? Thanks for the info and photos! I'm right in the midst of trying to decide which way to go for interior panels and this looks like a very interesting option. I was looking at the units from Hammer Plastics. It looks good but they want to sell a 20 set minimum, so I'm out. Might I ask which pieces did you get for the price you stated? I contemplating a ceiling kit only or the whole deal. I'm still thinking about doing flat panels for the lower areas, not sure. I liked how Hammer did the sides in 2 sections, that's my first choice if I could get it. I'd like to do black on the lower and grey on the upper. Very rigid. You can see in the first photos that I backed the unistrut up with large flat washers around the pre-bulbed thread inserts. When the bolts holding it are torqued up it's very solid. For the platform I bolt aluminum angle to the unistrut, then just strap the folding frame down to it. Eventually I will probably have it drilled to pin in place. 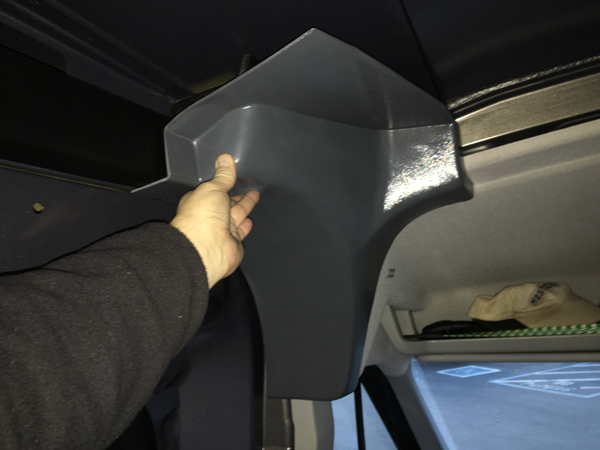 The kit included both side panels, plus pieces that go across the front & back, apice that covers the foam block on the driver side, and a piec that covers the foam block and extends across the top of the sliding door on the passenger side. 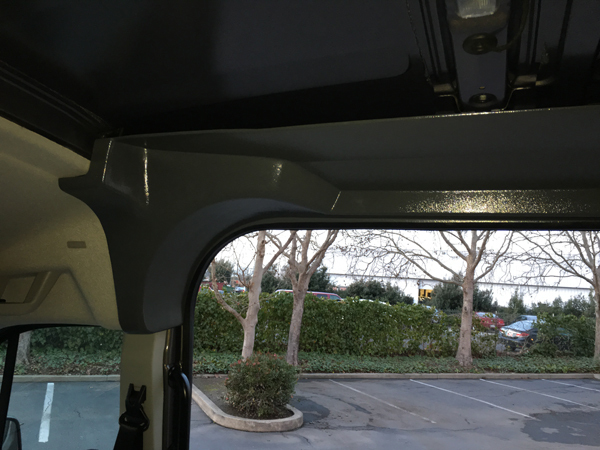 No headliner, and no panels for the doors or window trim on the doors. The Hammer set that you posted looks very nice. What kind of pricing per unit for the lot of 20? 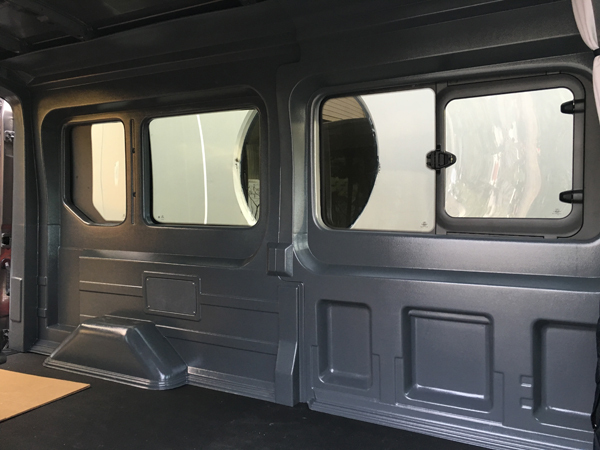 The kit included both side panels, plus pieces that go across the front & back, a piece that covers the foam block on the driver side, and a piece that covers the foam block and extends across the top of the sliding door on the passenger side. 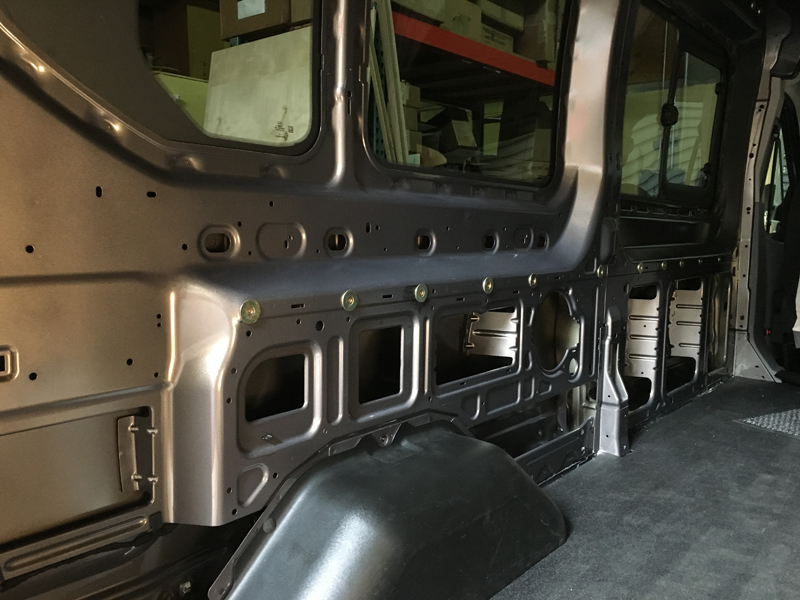 No headliner, and no panels for the doors or window trim on the doors. OK, so no headliner panel? That's one of the primary pieces I'm looking for. I did not get a per set price from Hammer. The guy responded by email and just said "we only do 20 set minimums".... I guess they only want to sell to outfitters, sux. So I never got a price. I could probably get one but didn't see the point. It's really too bad Hammer doesn't sell individual pieces so you can build a set that fits your needs. Maybe later some distributor will offer this, seems like a natural to me. I must say, the more I look at these vacuum formed "kits" the more simply building my own panels from sheet stock (Coroplast or Celtec) seems to make the most sense. I love the finished look of the formed panels but the cost and limitations aren't so attractive. I do understand the economics of it as I'm in the vacuum forming business myself, I just don't have a large enough forming machine to handle these panels.